Today is Armistice Day and Remembrance Sunday. The 11th day of the 11th month. So it is right that today I say thank you to all our armed forces, past and present, who have given their lives for our safety and freedom. My dad and brother are both Air Force-turned-Air National Guard men, both have served abroad, my grandfather fought in Korea, my cousin fought in Afghanistan, and a school friend and brother of a school friend lost his life while serving his country. My dad used to try to convince me to join the military, but it was never my thing. At all. My brother did ROTC in school, but that to me was the last place I'd wanted to be. I don't know how to put this appropriately, but I never wanted anything to do with the military, myself. I get that wars are sometimes necessary, but I hate them. (I guess no one loves them.) I just couldn't understand volunteering for that life. So I suppose that makes me selfish. Or maybe not. Maybe it just isn't my calling. But it makes me all the more grateful for the unselfish people who chose, and choose, to devote their lives - and I don't mean just the living part, but also the dying - for the rest of us. What a brave, incomprehensible sacrifice, that I know I'm not big enough to make! Yet these incredible people fight for my freedom, even though I'm too selfish, too chicken, too wannabe-pacifist to do it for myself. How can I ever thank these people enough for what they do for me? I cannot imagine seeing the atrocities they see at war. I cannot imagine facing the fear they must face in the trenches or in the air. I cannot imagine the pressure they must feel, fighting for something as huge as the Greater Good or Freedom or any other worthy cause; must less, I can't imagine the conflict some must feel at fighting a war they may personally disagree with, where the ideology of the war is contrary to their own ideologies. And yet they fight anyway, out of honour and duty to their countries. Wow. 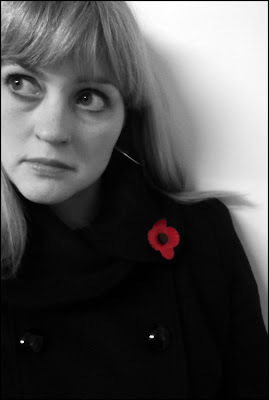 I wear a poppy each year... well, scratch that, I buy and subsequently lose several poppies each year. I don't feel I know very much about World War 1 (I think history education in America is absolutely appalling when it comes to teaching students about the rest of the world); Scott has tried to tell me all about WW1, but I still know very little about it. I only know slightly more about WW2 for that matter, which, again, I blame school for. (I mean, do Americans actually teach the WW2 started in 1942?!) But despite my lack of knowledge, which I am ashamed of, I wear a poppy simply to support those who lived and died fighting for a cause that was right. I want to support and thank those who are fighting right now, whether I agree with the wars currently going on or not. Because at the end of the day, they have the courage to fight on behalf of their countrymen and women, and I do not. So thank you, service men and women out there. I am thankful for what you do, on my behalf. And whether I or anyone else supports the actual wars that you are called to fight in or not, I will still say, thank you for doing it. You live a bigger life than I ever will, and your legacies are never forgotten. I am thankful for you.